Understanding literacies from a sociocultural perspective means that reading and writing can only be understood in the contexts of social, cultural, political, economic, historical practices to which they are integral, of which they are a part. This view lies at the heart of what Gee (1996) calls the “new” literacy studies, or socioliteracy studies … . The relationship between human practice and the production, distribution, exchange, refinement, negotiation and contestation of meanings is a key idea here. Human practices are meaningful ways of doing things or getting things done … . There is no practice without meaning, just as there is no meaning outside of practice. Within contexts of human practice, language (words, literacy, texts) gives meaning to contexts and, dialectically, contexts give meaning to language. Hence, there is no reading or writing in any meaningful sense of each term outside social practices. Our idea of “meaningful content” that is generated and negotiated within literacy practices is, however, wider and looser than many literacy scholars might accept. We think Gee’s … Discourse approach to literacies draws attention to the complexity and richness of the relationship between literacies and “ways of being together in the world” … . So, for example, when we look at somebody’s weblog we might well find that much of the meaning to be made from the content has to do with who we think the blog writer is: what they are like, how they want to think of themselves, and how they want us to think of them. Likewise, a particular  text that someone produces might well be best understood as an expression of wanting to feel “connected” or “related” right now. The meaning carried by the content might be much more relational than literal. It might be more about expressing solidarity or affinity with particular people. Our idea of “meaningful content” is intended to be sufficiently elastic to accommodate these possibilities. This is an important point when it comes to understanding the internet, online practices and online “content.” Almost anything available online becomes a resource for diverse kinds of meaning making. In many cases the meanings that are made will not be intelligible to people at large or, in some cases, to many people at all. Some might be shared only by “insiders” of quite small interest groups or cliques. Consider, for example, the way that eBay has been used to spoof a range of social conventions and to generate diverse kinds of quirky and “nutty” activity. A man auctioned his soul in 2006 and received a cash payment that came with the condition that he would spend 50 hours in church. In another case an individual auctioned a ten-year-old toasted cheese sandwich the owner said had an imprint of the Virgin Mary on it, and that had not gone mouldy or disintegrated since it was made in 1994. Moreover, she said it had brought her luck at a casino. An internet casino purchased the sandwich for $28,000 and planned to take it on tour to raise money for charity. Other sellers responded with Virgin Mary toasted sandwich makers, T-shirts, etc. (see: news.bbc.co.uk/2/hi/americas/4034787.stm). On 5 May 2006, Yahoo! sports pages reported a Kansas City Royals baseball fan of 25 years finally giving up on the club and auctioning his loyalty. The meaning of such actions have little to do with established practices of auctioning, and the interpretation of texts describing the items have little or nothing to do with the literal words per se. People may be prepared to spend money just to be in solidarity with the spoof: to say “I get it,” and thereby signal their insiderness with the practice, express solidarity with the seller, or, even, to try and save a soul. By defining literacies in relation to “encoded texts” we mean texts that have been rendered in a form that allows them to be retrieved, worked with, and made available independently of the physical presence of another person. “Encoded texts” are texts that have been “frozen” or “captured” in ways that free them from their immediate context of production so that they are “transportable.” Encoded texts give (semi) permanence, transcendence, and transportability to language that is not available in the immediacy of speech, hand signs, and the like. They can “travel” without requiring particular people to transport them. They can be replicated independently of needing other human beings to host the replication. The particular kinds of codes employed in literacy practices are varied and contingent. Literacies can involve any kind of codification system that “captures” language in the sense we have described. Literacy includes “letteracy” (i.e., within the English language, recognition and manipulation of alphabetic symbols), but in our view goes far beyond this. Someone who “freezes”  language as a digitally encoded passage of speech and uploads it to the internet as a podcast is engaging in literacy. As constitutive elements of participation in or membership of a Discourse, literacies always involve much more than simply producing and negotiating texts per se. They are contexts and pretexts for enacting and refining memberships of Discourses that include such dimensions as feeding back, providing support, sharing knowledge and expertise, explaining rules, sharing jokes, commiserating, doing one’s job, expressing opinions, showing solidarity, enacting an affinity … and so on. Hence, our claim that literacies are “socially recognized ways of generating, communicating and negotiating meaningful content through the medium of encoded texts within contexts of participating in Discourses (or, as members of Discourses)” … . As such, blogging, fanfic writing, manga producing, memeing, photoshopping, anime music video (AMV) practices, podcasting, vodcasting, and gaming are literacies, along with letter writing, keeping a diary, maintaining records, running a paper-based zine, reading literary novels and wordless picture books, reading graphic novels and comics, note-making during conference presentations or lectures, and reading bus timetables. The question of what constitutes “new” literacies is interesting, and different views exist. Our view … is that new literacies have what we call new “technical stuff” and new “ethos stuff.” We distinguish two categories of “new” literacies, which we refer to as paradigm cases of new literacies and peripheral cases of new literacies, respectively. 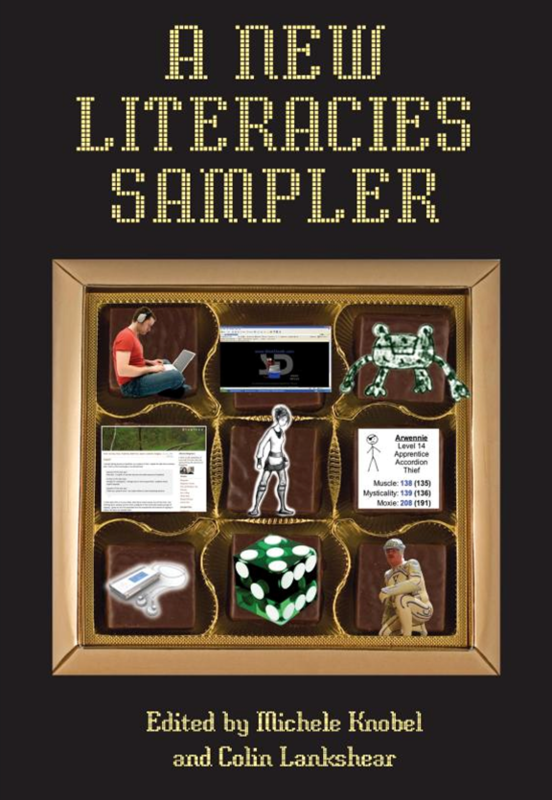 The new literacies sampled in this book are all examples of what we regard as paradigm cases. Paradigm cases of new literacies have both new “technical stuff” (digitality) and new “ethos stuff.” Peripheral cases of new literacies have new “ethos stuff” but not new “technical stuff.” In other words, if a literacy does not have what we call new ethos stuff we do not regard it as a new literacy, even if it has new technical stuff. … [It] is possible to use new technologies (digital electronic technologies) to simply replicate longstanding literacy practices—as we see ad infinitum in contemporary classrooms as well as in many workplaces. We think that what is central to new literacies is not the fact that we can now “look up information online” or write essays using a word processor rather than a pen or typewriter, or even that we can mix music with sophisticated software that works on run-of-the-mill computers but, rather, that they mobilize very different kinds of values and priorities and sensibilities than the literacies we are familiar with. The significance of the new technical stuff has mainly to do with how it enables people to build and participate in literacy practices that involve different kinds of values, sensibilities, norms and procedures and so on from those that characterize conventional literacies. For present purposes, most of what is important “new technical stuff” is summarized in Mary Kalantzis’ idea that “You click for ‘A’ and you click for ‘red’“ … . Basically, programmers write source code that is stored as binary code (combinations of 0s and Is) which drives different kinds of applications (for text, sound, image, animation, communications functions, etc.) on digital-electronic apparatuses (computers, games hardware, CD and mp3 players, etc.). Someone with access to a fairly standard computer and internet connection, and who has fairly elementary knowledge of standard software applications can create a diverse range of meaningful artifacts using a strictly finite set of physical operations or techniques (keying, clicking, cropping, dragging), in a tiny space, with just one or two (albeit complex) “tools.” They can, for example, create a multimodal text and send it to a person, a group, or an entire internet community in next to no time and at next to no cost. The text could be a photoshopped image posted to Flickr.com. It could be an animated Valentine’s Day card sent to an intimate friend. It could be a short animated film sequence using toys and objects found at home with an original music soundtrack, attached to a blog post. It could be a slide presentation of images of some event with narrated commentary, or remixed clips from a videogame that spoof some aspect of popular culture or that retell some obscure literary work in cartoon animations. Relatively unsophisticated desktop publishing software can generate text and image effects that the best printers often could not manage under typographic conditions, and “publishing” now is no longer limited to print or images on paper, but can include additional media such as voice recordings, music files, 2D and 3D animation, video, paintshopped images, scanned images of paper-based artworks, etc. Even the concept of “text” as understood in conventional print terms becomes a hazy concept when considering the enormous array of expressive media now available to everyday folk. Diverse practices of “remixing”—where a range of original materials are copied, cut, spliced, edited, reworked, and mixed into a new creation—have become highly popular in part because of the quality of product it is possible for “ordinary people” to achieve. Machinima animations are a good example of what we mean here. “Machinima” refers to the process by which fans use video game animation “engines” (the code that “drives” or generates all the images in a given video game) and computer-generated imagery (CGI) to render new animated texts on their desktop computers. Until recently such productions required expensive, high-end 3D graphics and animation engines that were usually the preserve of professional animators. Creating machinima involves using tools found within the game engine, like camera angle options, script editors, level editors, and the like, along with resources, such as backgrounds, themes, characters, settings etc. available in the game … . Similarly, music can be sampled and remixed using desktop computers and audio editing software. The term “remix” grew out of the DJ sampling, scratching and mixing scene that began in the late 1970s and early 1980s (although music remixing itself has a long history as a practice; cfi, blues music, ska music from Jamaica). Music remixing no longer requires extensive and eclectic vinyl record collections, multiple turntables and bulky and expensive mixing and amplification equipment as it did in the 1970s. Software that comes bundled with most computers allows users to convert music files from a CD into an editable format (e.g., *.wav), edit and splice sections of different songs together and to convert the final music files back into a highly portable format (e.g., *.mp3) and upload them to the internet for others to access or, alternatively, use them as background soundtracks in larger do-it-yourself multimedia projects. These are some typical examples of the kinds of technological trends and developments we think of as comprising new technical stuff. They represent a quantum shift beyond typographic means of text production as well as beyond analogue forms of sound and image production. They can be employed to do in new ways “the same kinds of things we have previously known.” Equally, however, they can be integrated into literacy practices (and other kinds of social practices) that in some significant sense represent new phenomena. The extent to which they are integrated into literacy practices that can be seen as being “new” in a significant sense will reflect the extent to which these literacy practices involve different kinds of values, emphases, priorities, perspectives, orientations and sensibilities from those that typify conventional literacy practices that became established during the era of print and analogue forms of representation and, in some cases, even earlier. When we say that new literacies involve different “ethos stuff” from that which is typically associated with conventional literacies we mean that new literacies are more “participatory,” “collaborative,” and “distributed” in nature than conventional literacies. That is, they are less “published,” “individuated,” and “author-centric” than conventional literacies. They are also less “expert-dominated” than conventional literacies. The rules and norms that govern them are more fluid and less abiding than those we typically associate with established literacies. We understand this difference in “ethos” between conventional and new literacies in terms of a much larger historical and social phenomenon that involves a “fracturing of space” accompanied by the emergence of a new kind of mindset … . The idea of space having been fractured refers to the emergence of cyberspace as a distinctively new space that co-exists with physical space … . Cyberspace has not displaced physical space, of course, and will not displace it. Neither, however, can physical space “dismiss” cyberspace. For the majority of young people in so-called developed countries who are now adolescents, cyberspace has been integral to their experience of “spatiality” since their early years. In these same countries an entire generation has grown up in a world saturated by digital electronic technologies, many of which are linked via cyberspace to form an enormous network. Co-existence is the destiny of physical space and cyberspace. Neither is about to go away. The idea that this fracturing of space has been accompanied by the emergence and evolution of a new mindset is evident in the difference between people who approach the contemporary world through two different lenses. The first is what we call a “physical-industrial” mindset. The second is what we call a “cyberspatial-postindustrial” mindset. The “ethos stuff” of new literacies reflects the second mindset. As we will see, much of this ethos is encapsulated in talk which has emerged recently around the concept of Web 2.0. The first mindset assumes that the contemporary world is essentially the way it has been throughout the modern-industrial period, only now it has been technologized in a new and very sophisticated way. To all intents and purposes, however, the world on which these new technologies are brought to bear is more or less the same economic, cultural, social world that has evolved throughout the modern era, where things got done by means of routines that were predicated on longstanding assumptions about bodies, materials, property and forms of ownership, industrial techniques and principles, physical texts, face to face dealings (and physical proxies for them), and so on. The second mindset assumes that the contemporary world is different in important ways from how it was even 30 years ago, and that this difference is growing. Much of this change is related to the development of new internetworked technologies and new ways of doing things and new ways of being that are enabled by these technologies. More and more the world is being changed as a result of people exploring hunches and “visions” of what might be possible given the potential of digital technologies and electronic networks. The world is being changed in some quite fundamental ways as a result of people imagining and exploring new ways of doing things and new ways of being that are made possible by new tools and techniques, rather than using new technologies to do familiar things in more “technologized” ways (first mindset). Some important differences between the mindsets can be dimensionalized along lines presented in [the following] table. This is a heuristic device that somewhat polarizes the mindsets. Things are obviously more complex than a simple table can capture. And other people are likely to emphasize alternative dimensions of difference than the ones highlighted here. Nonetheless, the dimensions addressed here will be sufficient to convey our view of the new “ethos stuff” we believe characterizes new literacies. The points made by Barlow … translate into elements of an ethos associated with the second mindset and that can be seen “writ large” in diverse emerging online literacies. Two stand out in particular. One might be described as the “will” of information to be “free,” in the sense of “free” elucidated by Lawrence Lessig … in his book, Free Culture. This is the idea that cultural creation requires the freedom and capacity of ordinary people to draw on elements of prior cultural production to use as raw materials for further creative work. This does not mean pirating, and it does not mean copying without citation. What it does mean, however, is that people should be free to take (with appropriate recognition) “bits” of cultural production that are in circulation and use them to create new ideas, concepts, artifacts and statements, without having to seek permission to re-use, or to be hit with a writ for using particular animation or music sequences as components in “remixes” … that make something significantly new out of the remixed components. The contemporary explosion of remix practices in fan fiction, Anime-Music-Video production, music, cosplay, photoshopping images and the like, bespeaks mass popular participation in expressing this will of information to be free. …. [A] second point is the way in which information is mobilized for, or made into the medium of, relatedness through participation in online affinity spaces … . Much of the point behind remix practices, for example, is to be and feel connected to other people and to celebrate a fandom: to participate in an affinity, to make shared meanings, to brighten the day, share a laugh, share one’s passion for a product or a character, and so on. Conventional practices analogous to cultural remix, such as academic research and scholarship, include such values and orientations at their best, but typically embrace “higher callings” like pursuit of truth, advancement of knowledge, contribution to modernist progress, and furthering the field. The dominance of the book as the text paradigm, social relations of control associated with “bookspace,” and a discernible textual “order” are integral to the first mindset. During the age of print the book comprised the text paradigm. It shaped conceptions of layout, it was the pinnacle of textual authority, and it played a central role in organizing practices and routines in major social institutions. The book mediated social relations of control and power, as between author and readers, authorial voice us the voice of expert and authority, teacher/expert and student/learner, priest/minister and congregation, and so on. Textual forms and formats were relatively stable and were “policed” to ensure conformity. Certain genres of texts were privileged over others and seen as appropriate within particular (institutional) settings—e.g., school classrooms—whereas others were regarded as more marginal and not appropriate. Books exerted great influence on institutional space, architecture and furniture, as well as on norms for conduct within particular spaces. The book in no way comprises the text paradigm in the emerging digital media space. Indeed, there is no text paradigm. Text types are subject to wholes; experimentation, hybridization, and rule breaking. Conventional social relations associated with roles of author/authority and expert have broken down radically under the move from “publishing” to participation, from centralized authority mass collaboration, and so on. The organization of space, architecture and furniture, and control of movement associated with bookspace has become a curious aberration under the sign of new media. While people who grew up under the hegemony of the book and a stable “generic order” may ponder whether it is “proper” to write this kind of way in a blog, or to focus on this kind of theme, digital insiders seem much less preoccupied by such concerns. This is not to say there are no norms the new space, for there are. They are, however, less fixed, more fluid, and less policed, controlled and defined by “centralized” authorities and experts. The sheer proliferation of textual types and spaces means there is always somewhere to “go” where one’s “ways” will be acceptable, where there will be freedom to engage them and where traditional emphases on “credibility” are utterly subordinated to the pursuit of relationships and the celebration of sociality. Similarly, the new ethos stuff associated with the second mindset seriously disrupts authorial social relations. This can be illustrated nicely by game “modding” which involves the use of a video game’s image and strategy engines to create fan-driven “modifications” to or extensions of the game itself. These modifications remain “true” to the game’s “universe” (i.e., how characters can move, act, solve problems and what kinds of challenges are put in place, etc. within the world of the game), but add, say, a new mini-adventure or quest for characters to complete. Such additions may expand a level by adding new skills or qualities to the game, or a create an entirely new level for players to complete that adds a layer of difficulty or complexity to the game … . A quite different ethos is equally evident within the second mindset in relation to conceiving, negotiating, and enacting workspace. From the standpoint of the first mindset, space is typically thought of as enclosed, as having borders. In the educational context, learning space is bordered by the classroom walls, lesson space by the hour or 40-minute time signal, and curriculum and timetable space by the grid subjects to be covered and the time and physical space allocations assigned them. Tasks tend to be singular and defined or assessed at a given point in time, and learners are expected to be on task, which often means all students on the same task at the same time. Being not on that task is seen as being disengaged from learning. Learners who have grown up on the inside of a cyberspatial mindset often see things very differently and approach them very differently. The presumption that one will be working on one task at a time or in one “place” at a time when engaged in learning (or, for that matter, in entertainment or recreation) is foreign to many who approach and respond to their world from the second mindset. Multitasking has become ubiquitous among digital youth. Moreover, the multitasking mode is not seen simply some casual kind of modus operandi confined to interactions with one’s closest friends—as when chatting, roleplaying, updating a weblog, IM-ing, etc. simultaneously… . Rather, it is widely seen as a way of operating that applies generally in everyday life at home, at school and at play. … [M]uch of what we regard as the new kind of “ethos stuff” that characterizes “new” literacies is crystallized in … talk of “Web 1.0” and “Web 2.0” as different sets of design patterns and business models in software development, and in concrete examples of how the distinction plays out in real life cases and practices. Tim O’Reilly … observes that examples in the Web 1.0 column comprise products, artifacts or commodities produced from a source and made available to internet users. Britannica Online is an internet product subscribers can access for a fee. … The point here is not about commercial product delivery so much as the fact that what users receive are readymade artifacts or commodities. O’Reilly speaks here of “packaged software.” In Web 1.0 the “webtop” as a platform or user interface still largely emulates the desktop, with producers and consumers engaged in creating and consuming applications and informational artifacts. Users are not positioned as controllers of their own data. What one “gets” on a website is what web publishers put there. The logic is of use rather than participation; of reception and/or consumption rather than interactivity and agency. Directories and the taxonomies they are based upon or “enact” are developed at a “center” and are made available for users in the form that their creators have designed. They get used because they are presumed to he “authoritative” and to reflect “expertise” and “experience” and “wisdom” possessed by their designers. The picture is very different with Web 2.0. Part of the difference concerns the kind of products characteristic of Web 2.0. Unlike the “industrial” artifactual nature of Web 1.0 products, Web 2.0 is defined by a “post-industrial” worldview focused much more on “services” and “enabling” than on production and sale of material artifacts for private consumption. Production is based on “leverage,” “collective participation,” “collaboration” and distributed expertise and intelligence, much more than on manufacture of finished commodities by designated individuals and workteams operating in official production zones and/or drawing on concentrated expertise and intelligence within a shared physical setting. The free, collaboratively produced online encyclopedia, Wikipedia.org, provides a good example of collaborative writing that leverages collective intelligence for knowledge production in the public domain. Whereas an “official” encyclopedia is produced on the principle of recognized experts being contracted to write entries on designated topics, and the collected entries being formally published by a company, Wikipedia entries are written by anyone who wants to contribute their knowledge and understanding and are edited by anyone else who thinks they can improve on what is already there. Wikipedia provides a short policy statement and a minimal set of guidelines to guide participants in their writing and editing. It is, then, an encyclopedia created by participation rather than via publishing. It “embraces the power of the web to harness collective intelligence” … .